In the past few years, camera drone technology has entered the film industry at an incredible rate. What started out as a very niche market populated by an elite group of pilots and operators has become somewhat of a free-for-all, especially with the constant introduction of more fail-safe, fool-proof camera drone technology at very affordable prices. It seems like everyone owns a drone these days and even a novice pilot can get decent cinematic results. However, while “decent” results may work for a large portion of the projects out there, it simply does not come close to cutting it for high-end productions that demand the very best in cinematic quality footage. For those productions who are fortunate enough to have the budget to bring in top aerial drone pilots and operators, they can essentially fly any camera package they want, including Arri Alexa Mini’s, RED Weapons, Sony F55’s, etc. paired with high end cinema glass – even Cooke anamorphic lenses! 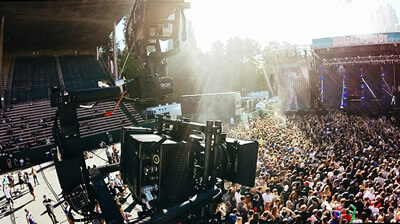 But flying full-on cinema camera packages comes with a price – the actual dollar price which can easily exceed $10,000 per day and the cost of risk – aerial drone packages do crash sometimes and despite a robust insurance policy covering gear replacement costs, if your rig goes down, the aerial portion of the day is done. And assuming you can afford a high-end heavy-lift drone package using top notch pilots with excellent flight records, what you can actually do with the drone legally and safely is a whole other issue. Want to get the camera close to your talent at high speeds? Want to shoot overhead aerials at a concert venue or over a crowd? Want to thread the needle through a dense forest at high speed? Want to shoot moving overhead shots indoors, even in tight quarters? 1) Find two solid anchor points – tree, light post, boulder, wood / metal beam, etc. 2) Connect a cable to the two points, making it as taut as possible with a tightening system such as an inline ratchet strap. 3) Add a camera “trolley” that smoothly travels along the cable – if non-motorized (aka gravity fed), then add guide lines to either end of the trolley so it can be pulled back and forth. 4) Attach your camera package to the trolley, ideally within a motorized head system for control over pan and tilt as well as better stabilization – the Freefly Systems MoVI being our gimbal of choice for this. 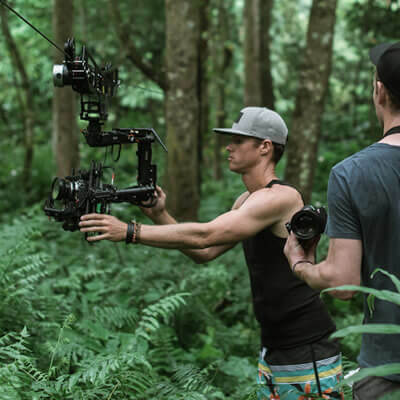 Motion State partner / operator Sam Nuttmann sets up the DEFY Dactylcam motorized cable cam system deep in the jungle of Hawaii for a Moxie Raia music video shoot, with 1st AC Ryan Brown at his side. On the first feature film I was brought on as MoVI Operator, “The Sea Of Trees” directed by Gus Van Sant, we spent weeks filming out in the woods around Worchester, Massachusetts. The story follows two men (Matthew McConaughey and Ken Watanabe), as they struggle to find their way out of a maze of trees and rocks. The Director of Photography Kasper Tuxen wanted to shoot their actions from a variety of angles, including following the men below from high up in the trees with the camera. There was no way to fly a drone through the dense forest, nor did we have the budget to do so even if it was possible. We did however have a team of rope riggers available to us, along with a myriad of climbing gear at our disposal. While there was some skepticism as to whether a non-motorized cable cam system would work well for our purposes, I got the go-ahead from Kasper and we set one up. About an hour later, we had our system set up over a cliff that the two actors were planning to scramble up. We set one anchor point slightly lower than the other so that gravity would help move the trolley along the rope, as well as a guide line on either end of the trolley, so a team of grips could control the speed at which the trolley traveled on the rope. The system worked amazingly well and what started as an experiment became a regular part of the rest of our shoot. Although we happened to have the rope rigging gear on-hand so it did not cost us any extra money to set our cable cam systems up, you could buy all the gear needed for a 500 foot non-motorized gravity fed cable cam system for around $500. When you see the quality of the shots in the film, I would say this is well worth that small cost! Later I worked on the AMC television series “Into The Badlands” and we used this same exact non-motorized gravity fed cable cam system to capture several action packed shots. It cost production no additional money and got us amazing results. 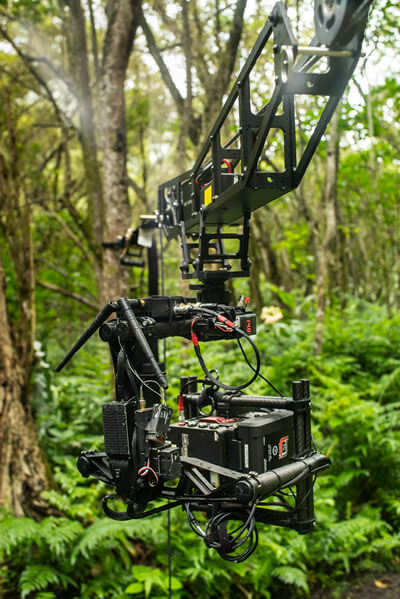 Director Of Photography Kasper Tuxen controls pan and tilt remotely via the Freefly Systems MoVI Controller as the MoVI M15 travels through the trees on a non-motorized cable cam system, following the actors Matthew McConaughey and Ken Watanabe through the woods on the feature film “The Sea Of Trees“, directed by Gus Van Sant. – Non-motorized systems require a whole team of people to be perfectly in sync when operating the system – the guide lines need to be pulled at the same speed and with the same strength, otherwise the camera will “jump” the line or ramp in and out of speed, causing a very noticeable, distracting camera movement. In other words, it is almost guaranteed you will be doing many takes to get the camera movement just right. + Motorized systems have perfectly controlled speed for the entire length of the cable and can be controlled easily by one person. – Setup time on a non-motorized system is considerably longer, as there are more cables to rig and more people to train on how to execute the camera movement. + Motorized systems can be set up in less than an hour by an experienced Motion State operator. – The faster you pull on a non-motorized system, the more erratic movement is added to the system, often resulting in camera sway and “jumping”. + Whether you go 5 mph or 50 mph on a motorized system, the performance is rock solid. – Pulling the ropes on a non-motorized system is exhausting. Especially after the 12 takes it will inevitably take to get it right. And the longer the cable length, the harder it becomes to move it. + A motorized cable cam system takes no effort to control the camera at all, no matter what the length of the cable is. When you bring our Motion State team of professionals on set to run a motorized cable cam system, you basically point where you want the camera to travel to and from, come back in less than an hour and we are ready to shoot. Motion State’s DEFY Dactylcam safely flies over a massive crowd at the Bumbershoot 2016 music festival. Full cinema camera packages are no problem for the DEFY Dactylcam, which can handle up to 50 lbs of payload and travel at speeds over 35 mph. Cost is always an issue, no matter how big the budget is on your production. Your producer has Ferrari payments to make, we get it. While Motion State does not publish prices online to avoid the unsavory practice of competitor undercutting, our Dactylcam motorized cable cam rental / operator rates are very reasonable and affordable to most any size production. And if you already plan to have us on your shoot as MoVI operators, the additional cost of bringing our Dactylcam to set is very small. Contact us for more details on pricing and additional information.